How do You THANK Someone Who Just Saved Your Life? How do you THANK someone who just saved your life?? Mere words do not seem enough. I cannot begin to express how wonderful it was to meet you in October in Minnesota through Bill. 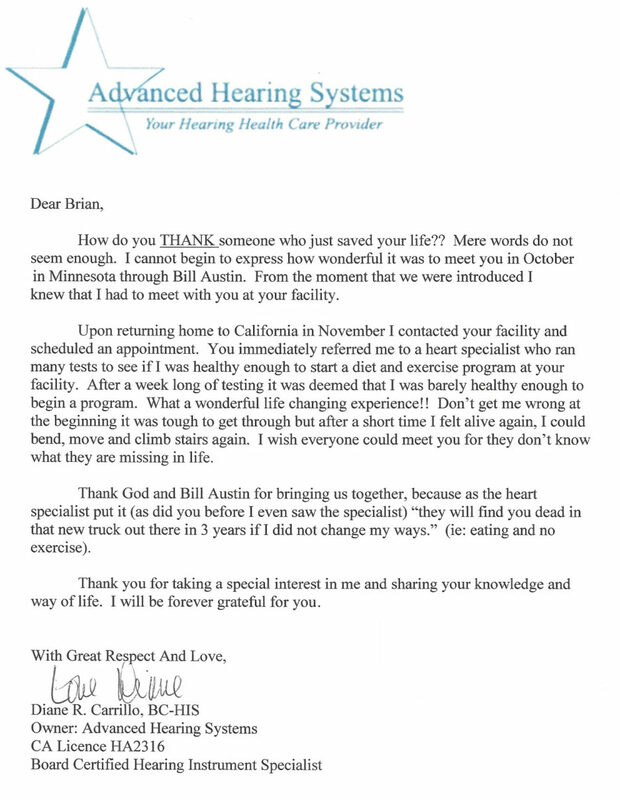 From the moment that we were introduced I knew that I had to meet with you at your facility. 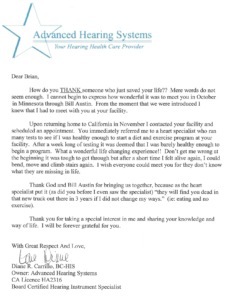 Upon returning home to California in November I contacted your facility and scheduled an appointment. You immediately referred me to a heart specialist who ran many tests to see if I was healthy enough to start a diet and exercise program at your facility. After a week long of testing it was deemed that I was barely healthy enough to begin a program. What a wonderful life changing experience!! Don’t get me wrong at the beginning it was tough to get through but after a short time I felt alive again, I could bend, move and climb stairs again. I wish everyone could meet you for they don’t know what they are missing in life. Thank God and Bill for bringing us together, because as the heart specialist put it (as did you before I even saw the specialist) “they will find you dead in that new truck out there in 3 years if I did not change my ways.” (ie: eating and no exercise). Thank you for taking a special interest in me and sharing your knowledge and way of life. I will be forever grateful for you.